1. Preheat the oven to 200°C, gas mark 6. Cut the aubergine in half lengthways, score the flesh and spread with half the garlic, drizzle with 1 tbsp of the olive oil and season. Place on a baking tray and bake for 30 minutes or until soft. 2. Meanwhile, place the rice in a saucepan with 1 litre cold water and a pinch of salt. Bring to the boil, then simmer for 20 minutes until cooked. Drain well and set aside. 3. Heat the remaining olive oil in a saucepan and gently cook the onion, chilli and remaining garlic for 5 minutes, or until soft. Add the baharat, cook for 2 minutes then add the tomatoes and cook for 2 minutes more until the tomatoes just start to break down. Fold through the harissa paste, diced tofu and the cooked rice. 4. Remove the aubergine from the oven and allow to cool slightly before scooping the flesh from the skin, being careful not to break the shells as you will need them. Roughly chop the flesh and add to the rice mixture along with the lemon zest and juice and mix well and season. 5. 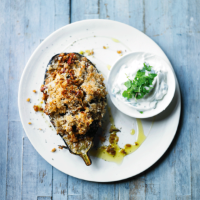 Stuff the aubergine and rice mixture back into the aubergine skins, top with the breadcrumbs, drizzle with extra virgin olive oil and grill for 5 minutes or until golden. 6. Meanwhile, mix the yogurt with the mint and serve alongside the stuffed aubergines.